It was my third trip to Hargeisa. Last time I traveled to the city was November 2016 when I stayed two days. This time I was excited to be traveling to Hargeisa although I had concerns and uncertainty about the airport. A few weeks ago, the passport of a friend of mine was confiscated in Mogadishu airport after the immigration officers found that the Somaliland immigration authorities stamped an entry visa for the Somali passport holder upon his arrival at the airport. I was told that this had stopped recently, and things were smooth for my arrival. At the airport, there were no weapons. Hargeisa is completely different from the Mogadishu I came from. During my stay there, I did not see armed forces patrolling the city or guarding buildings. With nice weather during the day and cold nights, I had the opportunity to go around the city. I went to Sultan restaurant with a great friend, a motivational speaker and a role model for many young Somalis, Mohamed Omer. That night we discussed our life histories and the challenges we encountered in our formative years. It was a night on which we ended up discussing successes and failures, the importance of sharing life stories and motivating and inspiring the young generation. Hargeisa is a center for preserving Somali heritage. The next afternoon I went to Hargeisa Cultural Center with colleagues. I had the opportunity to see the great work that the center is doing. At the entrance gate, there is a ‘Bun iyo Buug’cafeteria. Adjacent to the cafeteria is a library. Students were there reading books. The director told us that they recently brought books for high school students, and the number of visitors to the library has been increasing recently. Teenagers of both genders were at a nearby hall. They were in two lines. One plays music and another one dances with the music, while the remaining were clapping and applauding. It was interesting and I enjoyed watching. I was told later that the hall is booked each afternoon by different teams. It is a space for training and rehearsals. The center also hosts the Hargeisa International Book Fair, an annual event that brings together authors, readers, and publishers. The Hargeisa Cultural Center also has an art gallery. There are collections of audio records of Somali music, books about Somali literature and history, old Somali shillings, an artwork of historical Somali sites such as the home of Sayid Mohammed Abdulle Hassan, and arts depicting the Somali camel, and maps of historical sites. It was a beautiful place to be. It’s not only Hargeisa Cultural Center that illustrates Hargeisa’s leading role in preserving Somali heritage. Hiddo-Dhawr is another cultural center in Hargeisa. It has different halls, each named after a great Somali poet. I had the opportunity to spend hours at the center. There were singers and musicians at the hall. The program started at 8:30 PM. Each table is booked in advance. There was live music for about one and a half hours. Food is served as you enjoy the music. Then there was an interval for about 30 minutes. A moderator entertained the guests. He presented the rules of the game. He said that he will give the microphone to one person randomly selected on each table, and that person must recite something: either a song or a poem. Among the participants were non-Somalis. One of them was given the microphone and everyone in the audience found his song was hilarious. After 10:00 PM, the live music continued. Unlike me (I don’t know many songs), many of the participants seemed to have memorized almost all the songs. It was a new and exciting experience for me that showed Hargeisa’s deep roots in Somali culture. I have never been to Borama. This time I had the opportunity to spend a day in the historical city. My friend and I had already planned a trip to Borama a while ago when we met in Mogadishu. Unlike many other cities I have visited in Somalia through direct flights, we went to Borama via road. What made this trip so enriching was that I was traveling with a native – an inspiring young luminary from the city itself – Mohamed Omer. The road was smooth. We went through several towns along the way including Abaarso, Arabsiyo, Gebiley, and Dila. Abaarso town is known for Abaarso school, which had produced talented students who won scholarships to prestigious universities in the US. Gebiley had an interesting feature. Before we entered the city, we saw trees along the main tarmac road. I was told that this city is unique in that every couple should plant trees when they are getting married. This is a unique practice that is good for the environment. 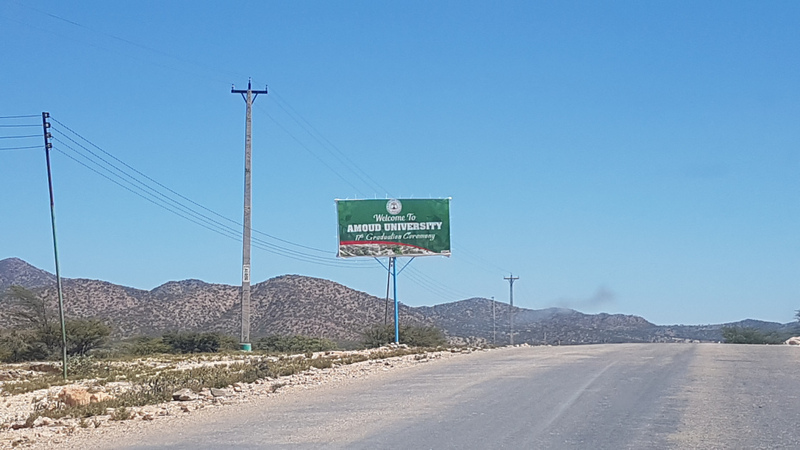 A few kilometers away from Borama – our final destination – is Ayaan-Daran farm. It is a farm at the border; it is partly in Somaliland and partly in Ethiopia. That is why it is ‘bad omen’. When we reached Borama, we went straight to Amoud University. The university building had its foundations laid in 1952, and it was started as a boarding secondary school. My friend Mohamed Omer was born inside the university building. It was an emotional moment when we visited the same room he was born in. His father was a headmaster at the school at the time; he started working with the school as a teacher in 1982, and he then became the school principal in 1988 until 1991. The boarding secondary school was turned into a university in 1997. The University has no main entrance gate. It has blocks. Each block is either an administrative office or a faculty. It has gardens. It is green, quiet, and is a pleasant environment for teaching and learning. The university has a big graduation hall that can accommodate 2,500 persons. 17 batches have already graduated from the university since 1997. During the university graduations, the city is visited by people from other Somaliland towns. The university has produced many young talents including my friend. The hotels in Borama are unique. The green is everywhere. We visited two hotels, and both were green and convenient. Other than hotels, business is booming and basic commodities are cheap and affordable. The most important treasure of the city is its people. The people I met, both old and young, were hospitable. Some asked me questions about Mogadishu and how it looks. They had never been to Mogadishu and only hear of its troubles from the media. Borama is a city I would like to live in. It is green and peaceful and its people are welcoming and friendly. My trip to Hargeisa and Borama was both exciting and enriching. It was an eye-opening experience – it revealed to me the stark differences in circumstance between those of us in Mogadishu and our peers in Hargeisa and Borama.